Be creative! Transform your toy parts, mini to small bagels, adding machine tape, wood parts or plastic parts with this 4" long SS bolt. Attaches to the side of the cage. Comes with three 2" washers to secure parts on both ends! Don't take chances! Refillable stainless steel toy making base. Screw type closure. Approximately 3" diameter when closed and 1/16" thick. Great for stringing a wide variety of small bird toy parts. Stainless Steel Swivel Hook 3 3/8"
Great for hanging large toys from the top of the cage, or boings or swings. 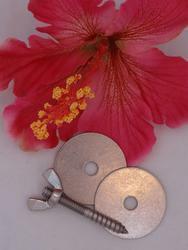 Stainless steel spring hook attaches to a swivel hook for 360 degree movement of the toy or boing attached. Great for hanging small toys. 100% bird safe. Stainless Steel Toy Base Ring 7"
Refillable stainless steel toy making base. Screw type closure. Great for stringing a wide variety of parts or even use it for fruits and veggies. Dishwasher safe! Please note that the screw assembly is now made of brass and not stainless steel. Don't take chances! 10" long Stainless Steel kabob toy base. Easy, refillable and safe. Stainless Steel 5/16-18 Hanger Bolt 2"
Fully threaded stainless steel 5/16-18" hanger bolts are 2" total length (1" wood screw thread, 1" machine screw thread). Pairs with the 2" washer and 5/16-18 Forged Wing Nut. Fully threaded stainless steel 5/16-18" hanger bolts are 2" total length (1" wood screw thread, 1" machine screw thread). Pairs with the 2" washer and 5/15-18 Forged Wing Nut. Fully threaded stainless steel 5/16" forged wing nut. Pairs with the 2" washer and 5/16-18 2" Hanger Bolt. One (1) fully threaded stainless steel 5/16" forged wing nut, two (2) 2" washers and one (1) 5/16-18 2" Hanger Bolt. Stainless Steel 1/4-20 Hanger Bolt 2"
Fully threaded stainless steel 1/4" - 20 hanger bolts are 2" total length (1" wood screw thread, 1" machine screw thread). Pairs with the 1.5" washer and 1/4-20 Forged Wing Nut. Fully threaded stainless steel 1/4"- 20 hanger bolts are 2" total length (1" wood screw thread, 1" machine screw thread). Pairs with the 1.5" washer and 1/4-20 Forged Wing Nut. Stainless Steel 1/4-20 Hanger Bolt 1 1/2"
Fully threaded stainless steel 1/4" - 20 hanger bolts are 1 1/2" total length (.75" wood screw thread, .75" machine screw thread). Pairs with the 1.5" washer and 1/4-20 Forged Wing Nut. Fully threaded stainless steel 1/4" forged wing nut. Pairs with the 1 1/2" washer and 1/4-20 x 2" and/or 1/4-20 x 1 1/2" Hanger Bolts. Stainless Steel 10-24 Hanger Bolt 2"
Fully threaded stainless steel 3/16" - 24 hanger bolts are 2" total length. Pairs with the 1 1/4" washer and 10-24 Forged Wing Nut.